Younis Habib, the quintessential crook, has little credibility. The ailing ex-convict and chief executive of the defunct Mehran Bank was the central figure who disbursed as much as Rs 1.40 billion of public money to politicians and generals. President Ghulam Ishaq Khan is no longer alive to corroborate the discredited banker’s version. But appearance of former army chief General Aslam Beg – the initiator, and the ISI chief Lt General (rtd) Asad Durrani – the disburser, should be enough to corroborate the banker’s version. It is clear that the main objective of the army and its intelligence arm the ISI, with a nod from President Ghulam Ishaq Khan, was to bribe politicians between 1990 and 1994. The hatchet job was done to prevent the re-election of the PPP by forming an alliance of rightist parties spearheaded by Nawaz Sharif in the form of the Islamic Democratic Alliance (IJI). The most shameful aspect of the Mehrangate saga is that neither the politicians nor the military leadership of the time comes out looking too good. Ghulam Ishaq Khan, the self-styled paragon of virtue and political correctness on whose watch tainted money was distributed, is the villain of the piece. A number of politicians including the MQM supremo Altaf Hussain, Shahbaz Sharif and the Jamaat-e-Islami leadership have denied receiving any money. According to Younis Habib, the ISI gave Nawaz Sharif Rs 3.5 million. His brother Shahbaz Sharif allegedly received Rs 2.5 million from Asif Jamshed Shah (the senior executive of the bank at the time), a claim denied by Sharif. Nawaz now portrays himself as an anti-establishment politician who ironically is accusing the ISI of having launched Imran Khan to cut him down to size. In order to establish his credentials as a truly independent politician no longer playing ball with the powers that be, Sharif must explain his position i.e. under what circumstances did he receive the tainted money. In this context, Shahbaz Sharif’s frequent diatribes against “corrupt Zaradari” sound hollow laying the Sharifs open to the charge of merely playing the ‘good cop, bad cop’ charade. Admittedly it is a hard act to follow, accusing the PPP of being corrupt and anti-national while in the past having been recipient of funds for the very purpose of destabilising it. In the nineties, not only the army and the rightist parties but a large swath of opinion in the media considered Benazir Bhutto ‘a security risk’. So much so that when Indian Prime Minister Rajiv Gandhi visited Islamabad in 1988 to attend the SAARC summit, she was accused of warming up to him too much at the expense of a self-righteously narrow definition of the ‘national interest’. Credit must be given to the successor of General Aslam Beg, COAS General Waheed Kakar who during the second stint of Benazir Bhutto as prime minister in 1993 dissociated himself from the actions of his predecessor. 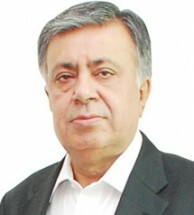 Terming the Mehran Bank scandal an individual act of Aslam Beg rather than an institutional decision, he did not object to interior minister General (rtd) Naseerullah Babar probing it. It is another matter that President Farooq Leghari, a PPP nominee, got cold feet at the time. It is indeed ironic that Aslam Beg stole Rs 40 million from the stolen fund to establish ‘Friends’, the so-called think tank headed by him. Apart from building his own image, Friends has produced nothing more than an extremely jaundiced version of politics and foreign policy. Aslam Beg in his deposition to the Supreme Court has washed his hands of the whole affair expressing complete surprise at why he has been dragged in the court. His ISI chief at the time, Lt General (rtd) Asad Durrani, through whom the money was disbursed has however taken the wind out of Beg’s denial. In his testimony in the court, Durrani has confirmed existence of an election cell at the presidency while Ghulam Ishaq Khan was president. He has also admitted that he distributed the tainted money on the express instructions of the army chief. With denials galore, many players no longer alive and crucial records mysteriously missing, the apex court may have some difficulty getting to the bottom of the scandal. Luckily, Air Marshal (rtd) Asghar Khan was present in the court to pursue his petition filed almost two decades ago. Some of the alleged beneficiaries like Nawaz Sharif are important players on the political scene and must be asked to shed light on the matter by the apex court. The octogenarian former bureaucrat Roedad Khan, who never tires of ranting about corrupt politicians in his frequent newspaper articles and utterances on talk shows, should be questioned about what he did with the money he received. Another matter that needs closure is the Memogate affair. The probing of the matter has graduated from the ridiculous to the sublime. Both the presidency and the military have denied maverick Mansoor Ijaz’s preposterous claim that President Zardari had intervened to stop interception of the US attack on Abbottabad by an F-16 aircraft on May 2. The star witness in the Memogate saga had alleged that the president passed these instructions to the COAS over the telephone. In reality, no such conversation ever took place. The Memogate Commission in its quixotic pursuit for the truth has allowed Ijaz to depose from London through a video link while former ambassador to Washington, Hussain Haqqani, has been summoned back. A large amount of funds, time and energy have been expended on the matter. Mansoor Ijaz is a fugitive from the US who now resides in Monaco and has little credibility. He has never hidden his distaste for the Pakistani military and the ISI. Despite this, our spymaster Lt General Pasha for reasons best known to him and his boss chose to go to London earlier last year to meet Ijaz. This meeting perhaps convinced the general that the memo was a reality. Hence, the affidavits submitted by him and General Kayani in the Supreme Court. With Haqqani already gone, General Shuja Pasha being replaced by Lt Gen Zaheerul Islam and the absence of a smoking gun leading to Zardari, it is perhaps time to move on. Surely there are more pressing matters of the state to attend to for all the stakeholders involved. The thing to see now is weather or not Supreme Court take Nawaz Sharif to task? Will it punish him for this crime of him or all its directives, orders and punishments are only for PPP and rest -as perception is developing now- have an undeclared immunity from what so ever they do? Will Nawaz Sharif be summoned in the court and will the judges pass insulting remarks on him as well like they always do in cases of PPP leadership. Mediamen always make too much out of very little against Zardari. Nation wants to see can they really utter similar verdicts in their "shows" and in their articles? or their journalism , too, is only to tarnish image of Bhuttos. "All are naked in this bath room"
Why the Justice took so long to act on the petition filed 16 years ago? This itself speaks of loopholes in judicial system. Now this is a matter for nawaz Sharif to return the money back to the exchequer if he is a real servant of people. The whole truth about Mehran Bank would never be known.Its license was issued under intense Nawaz pressure on SBP Grosvenor and eventually by abducting his son to obtain its license.It was a bank in Sindh quota then; another one is licensed now as Sindh Bank, whose fate can be predicted easily by any one. .After Mehran's demise, it ws forced to merge with NBP and its losses in excess of Rs.5 billion were borne by SBP and ultimately by our tax-payers.